Hybrid has appointed Stuart Cole in the newly created role of National Sales Manager – Industrial ProductsExclusive UK and Irish Mimaki distributor, Hybrid Services Ltd has announced the appointment of Stuart Cole to a newly created position of National Sales Manager – Industrial Products. 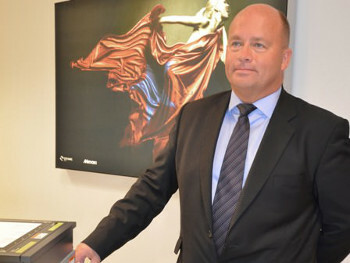 His primary responsibility will be to develop this market further for Mimaki as the company’s portfolio of flatbed and roll-to-roll LED UV printers continues to expand. Mimaki has already added two significant new products to its industrial products line-up in 2014, with the JFX200 8ft x 4ft LED UV flatbed and production roll-to-roll UJV500 machines launching at Sign & Digital UK. The new machines sit between the UJF range of small format flatbeds and the grand format JFX500 in a wide range of machines designed to deliver solutions across a broad array of markets. As part of Hybrid’s sales management restructure, John de la Roche will become National Sales Manager – Sign and Graphics, with similar responsibilities for Mimaki’s solvent printers, cutting plotters and the new generation of SUV and latex printers. Cole and de la Roche will work alongside each other to develop and strengthen Hybrid’s overall sales efforts and reseller channel.